The Sea Eagle PackFish7 is a unique, ultralight, incredibly portable, one man fishing boat that can be used two ways: (1) fished for hours while sitting on the comfortable inflatable Deluxe Fishing Seat, (2) standing with the wooden floorboard which provides stable and ample standing area for both sight fishing and casting. The hull weighs only 21 lbs. and fully loaded with floorboard, oars and seat a mere 32 lbs. It goes anywhere, sets up in under 5 minutes and can even be worn on your back! It's as simple as that! We call it the "grab and go fishing boat!". About the Frameless Fishing Series Sea Eagle's Frameless Fishing Boats are roomy, lightweight, ultra-portable, pack into a small bag, and can be stowed in small spaces because they have no frames. They don't require a trailer so you can carry them to the most remote, hard to reach locations where fish hide most! Great for lakes, rivers, bays, creeks or almost any body of water. Sea Eagle Frameless Fishing Boats will take you where you want to go and where most other boats wouldn't dare! Large air chambers allow these Frameless Fishing Boats to support an incredible amount of weight yet draft as little as 4 inches of water. Meaning you have access to shallower waters where heavier boats don't! Hit the water in as little as five minutes with the Sevylor Quikpak K1 1-Person Kayak, where getting to your next trek is as easy as backpack - unpack - kayak. The innovative backpack system carries everything you need to get going and ultimately folds out into your kayak's seat. 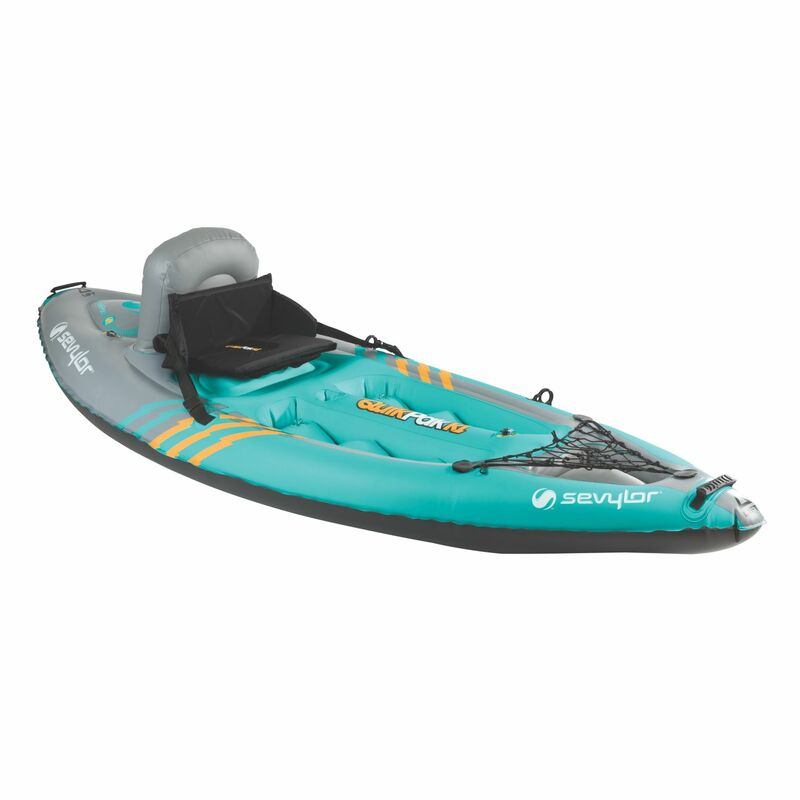 The 21-gauge PVC construction and rugged tarpaulin bottom easily handle the rigors of the lake. 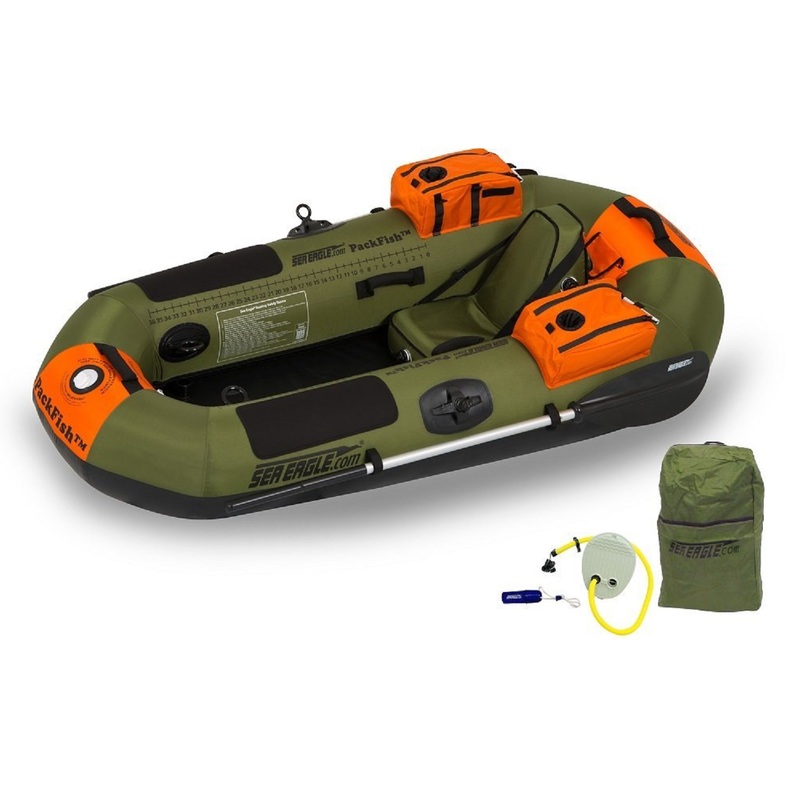 Just in case you do hit a snag, the multiple air chambers will help you get back to shore. The back rest and multi-position foot rest make exploring the waterways more comfortable. The drink holder and bungee storage area keep your drink and gear easily accessible.